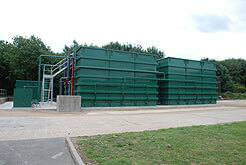 Severn Trent Water Limited constructed two aerobic treatment units (ATUs) at an existing Sewage Treatment Works. The ATUs were required as part of wider asset maintenance works being undertaken to expand wastewater treatment capacity in the Melbourne area of Derbyshire. The wider works comprised the installation of 4 new Submerged Aerated Filters (SAFs) to replace the existing High Rate Filter which was underperforming. The performance problems with the HRF were causing the works to operate at the top end of the consents limit set by the Environment Agency, with a high possibility of failures. Random biological filter media from Warden Biomedia were chosen to provide ultra-efficient and cost-effective aerobic treatment in the new ATUs for Severn Trent Water. 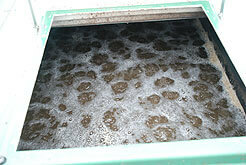 The aerated treatment units were manufactured and supplied by Haith Industrial. The excellent ventilation and high voidage performance of the Warden Biofil and Bioball filter media make them extremely effective in wastewater treatment applications. They are injection-moulded in polypropylene with specific design features to increase the efficiency of the biological process. Triangular fins increase the total surface area and encourage the formation of the biological films of bacteria, protozoa and fungi which will eat and biologically break down the organic content. The design also ensures high voidage to prevent blocking that might otherwise slow down the process. The serrated edges of the fins enable them to interlock in the filter bed giving excellent mechanical strength. With these purpose-designed features the biological filter media in the Warden Biomedia range are an excellent alternative to traditional mineral-based media and are perfect for overcoming problems of overloading in established trickling filter beds. No comments were found for Warden Biomedia Chosen for New Severn Trent Wastewater Plant - Case Study. Be the first to comment!